Local academies in Princeton helped maintain the relationship between the College of New Jersey and the South. As the College of New Jersey’s reputation and student body grew, an educational industry developed around Princeton. Advertisements appeared throughout the United States for local academies, often with endorsements from College of New Jersey faculty members. These academies helped maintain the relationship between the College of New Jersey and Southern planters. Through the academies, the college regularized the education of incoming pupils and gained access to students from Southern families. At the same time, Southern families who sent their sons to Princeton's local academies developed stronger ties to New Jersey. Isaac Van Arsdale Brown established “Maidenhead Academy”—later the Lawrenceville Academy—in 1810. A native of New Jersey, Brown was a College of New Jersey alumnus and a trustee from 1816 to 1861. (More than half of the instructors who taught at Lawrenceville School before the Civil War, in fact, graduated from the College of New Jersey.) Brown was also one of the founding members of the American Colonization Society and an anti-slavery advocate. The African people and all dark-skinned tribes are portions of the human race, identical with those of fair complexion. Brown proposed that enslaved people should be given “Christian knowledge and virtue” as well as passage to Africa. Throughout the book, Brown also disparaged the "Princeton writer," an essayist who had penned an article defending slavery in the Princeton Theological Seminary’s biblical journal. Brown published White Diamonds almost thirty years after he stopped working at the Lawrenceville Academy. However, Brown’s involvement with the colonization movement dated back to the first meeting of the ACS in 1816, meaning that his students likely heard sermons that promoted colonizationist views such as those he held. His views may have influenced the first known commencement address given at the school: a student-led oration "On Africa." Brown's career provides a window into Princeton's conservative intellectual landscape: though he attacked slavery's defenders, his own colonizationist views placed him among moderate anti-slavery advocates. In the early years of the school Brown had even worked alongside a pro-slavery man named Alex H. Phillips. Phillips co-directed the school with Brown beginning in 1832, but left within five years to move to Texas; he later supported secession during the Civil War. Phillips's son entered Princeton with the class of 1851, owned more than eight slaves and fought for the Confederacy. In 1837, Samuel McClintock Hamill, another College of New Jersey alumnus, took over the school. He would run the Academy through the Civil War until 1883. John Snells took special note of Lawrenceville’s popularity among Southern students in his book about Somerset and Hunterdon counties. A triennial catalogue from 1836 listed nine students from Southern states and three from Cuba, out of 116 students total. By 1860, the student body included 77 Southern students, as well as five from Cuba and four from Brazil. 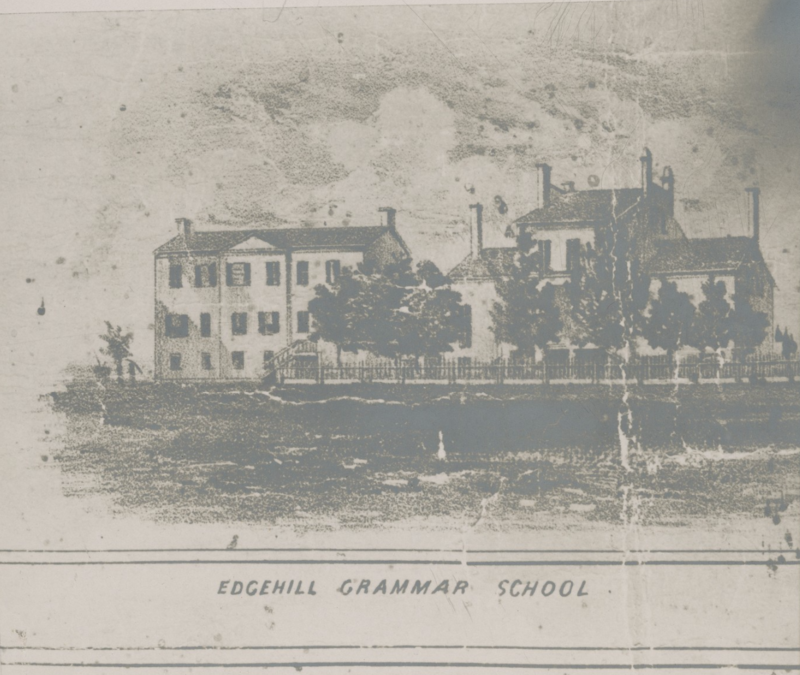 An 1849 photograph of the Edgehill School in Princeton, New Jersey. Career educator John Seeley Hart purchased Edgehill School, located on the same site as the modern-day Hun school, in 1837. He was also a graduate of the College of New Jersey and exceptionally close to President Carnahan. Upon his graduation in 1830, Hart received letters from James Carnahan, John Maclean Jr., Archibald Alexander, Albert Dod, and two tutors of the college recommending him to the trustees of the Natchez Academy in Mississippi. Although Dod described Hart's moral character as “unimpeached and unimpeachable," Carnahan saw fit to warn Hart to not taste the “bitterness of sin” in the South. Carnahan, himself a slave-owner, probably didn't mean the sin of slavery: according to a friend from the Wilkes-Barre Academy, Hart went to Mississippi primarily to make money. After a year, he returned to the Northeast, having earned enough to support his family. Hart was, at best, ambivalent about slavery. In a speech he drafted in 1848 for the Fourth of July, Hart warned about the degradation of the white "race," though he made no direct mention of African Americans. Yet he also condemned the actions of Monroe Edwards, infamous for running an illegal slave trade in the 1840s. Gentlemen living in other states, in the West-Indies and elsewhere, who may send their children to this school for instruction may be assured that due attention shall be paid to their wishes. Among the Southern students attending Edgehill in 1858 were six of the Goldthwaites of Alabama—a prominent family related to former Princeton president John Witherspoon, and a slave-holding dynasty. All of the Goldthwaite sons later attended the College of New Jersey, and at least four of them fought on the Confederate side when war broke out. Like Lawrenceville Academy, Edgehill served as a feeder school for the College of New Jersey. More than half of Edgehill's students in 1858, for example, continued their education at the college. If not for the outbreak of the Civil War three years later, undoubtedly many more Edgehill students would have gone on to Princeton. Zena Kesselman graduated Princeton University in 2017 with a degree in History and a certificate in Applications of Computer Programming. Her independent work centered on narratives of immigration and assimilation in the twentieth-century United States; her senior thesis followed the experiences of Korean-Americans before and after World War II. “Trustee Index, 1746-2001," Princeton University Rare Books and Special Collections, accessed 31 January 2017, http://rbsc.princeton.edu/databases/trustee-index-1746-2001. "Semi-Centennial Catalogue of the Classical and Commercial High School" (Trenton, NJ: Murphy and Bechtel, 1862); “Princeton Undergraduate Alumni Index, 1748-1920," Princeton University Rare Books and Special Collections, accessed 31 January 2017, http://rbsc.princeton.edu/databases/undergraduate-alumni-index-part-1. "Proceedings of the First Annual Meeting of the New Jersey Colonization Society" (Princeton, NJ: Princeton Press, n.d.). Isaac Van Arsdale Brown, White Diamonds Better Than ‘Black Diamonds,' (Trenton, NJ: Murphy and Bechtel, 1860), 10. Roland J. Mulford, History of the Lawrenceville School (Princeton, NJ: Princeton University Press, 1935), 18. "Princeton Undergraduate Alumni Index, 1748-1920"; “U.S., School Catalogs, 1765-1935," “1860 U.S. Federal Census - Slave Schedules," "Texas, Muster Roll Index Cards, 1838-1900," accessed 31 January 2017, www.ancestry.com. “Princeton Undergraduate Alumni Index, 1748-1920." Mulford, History of the Lawrenceville School, 37-8, 25, 34. “Semi-Centennial Catalogue of the Classical and Commercial High School," 45. Mulford, History of the Lawrenceville School, 49. John Maclean Jr., letter dated 1 October 1830; Jonathan B. Condit, letter dated 20 September 1830; Abraham Rezeau Brown, letter dated 23 September 1830; Albert Dod, letter dated 1 October 1830; James Carnahan, letter dated 1 October 1830; Archibald Alexander, letter dated 9 September 1836; John S. Hart Papers, Manuscripts Division, Department of Rare Books and Special Collections, Princeton University Library. Albert Dod, letter dated 1 October 1830, John S. Hart Papers, Manuscripts Division, Department of Rare Books and Special Collections, Princeton University Library. James Carnahan, letter dated 1 October 1830, John S. Hart Papers, Manuscripts Division, Department of Rare Books and Special Collections, Princeton University Library. George W. Woodward, letter dated 14 October 1847, John S. Hart Papers, Manuscripts Division, Department of Rare Books and Special Collections, Princeton University Library. “Princeton Undergraduate Alumni Index, 1748-1920”; “Edgehill School Catalogue and Circular” (n.p. : 1858), Manuscripts Division, Department of Rare Books and Special Collections, Princeton University Library. "Edgehill School," Southern Literary Messenger Vol. 4, No. 8 (1838), 1.